Dali Oberon 1 review | What Hi-Fi? With hindsight, we shouldn’t have been surprised by the quality of Dali’s Oberon 1s. 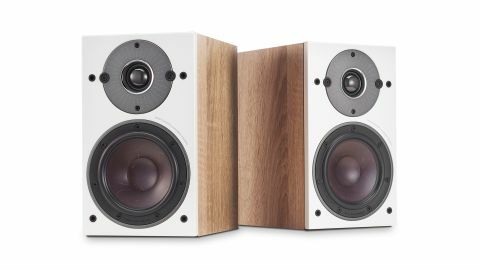 Dali has a generally brilliant track record with affordable standmounters and the 1’s floorstanding sibling, the Oberon 5 (£699), has just waltzed off with a 2018 What Hi-Fi? Award. Yet, we still weren’t quite prepared for the sound we heard out of these little boxes. About the size of a shoebox, the 1s keep strictly to convention as far as design is concerned. They are a two way, rear ported design, just like all of the established competition. But look closely and you’ll find areas where Dali’s engineers have tried to eke out an advantage. The tweeter uses a 29mm soft dome, which is claimed to be considerably lighter than that used on most rivals. The larger-than-normal size (most tweeter domes tend to be 25mm wide) means that it can delve lower in frequency than alternative designs, aiding integration with the mid/bass and generating higher outputs with less excursion. Much care has been taken with the motor system and managing the sound that comes off the back of the dome so that it doesn’t distort the forward output. Moving down in frequency, the 13cm mid/bass unit uses one of the company’s trademark wood/fibre cones. Dali has long preferred this material for its low weight, rigidity and fine self-damping properties. The mid/bass and tweeter are integrated with a single-wire crossover. The lack of biwiring isn’t an issue for us. It keeps things simpler, and lets the user concentrate their budget on a single high-quality speaker cable, rather than spreading the cost between two runs. The Oberon’s MDF cabinet is solid and nicely made. There are four finish options – black ash, white, dark walnut and the light oak of our review sample. At 27cm tall these speakers are compact enough to fit unobtrusively into most rooms. Dali has tried to keep this speaker as versatile as possible, even including a rear panel fixing to make wall mounting easier. While these speakers sound notably more balanced than most rivals when used right up against a wall, if possible, we suggest pulling them around 30cm into the room to make the most of their excellent stereo imaging and midrange clarity. As for partnering equipment, while we get good results with the Marantz CD6006 UK Edition CD player (£339) and matching amplifier (£369), these standmounters have more than enough sonic stretch to justify the use of electronics as capable as Cyrus’s CDi (£1195) and the Rega Elex-R amplifier (£949). That says a lot for the Oberon’s resolution and overall transparency. Speakers this small are never going to produce loads of bass. Compare these Dalis to the likes of the bigger Mission’s QX-2s and you’ll find there isn’t the same level of sonic authority or power at lower frequencies. That accepted, the laws of physics being what they are, we’re left with a wonderfully articulate performer that marries a bold, forthright nature with the kind of refinement and insight that’s rare at this level. The ’1s are stunning with vocal-based material. We listen to the likes of Tracy Chapman’s Telling Stories, Van Morrison’s Moondance and Bon Iver’s For Emma, Forever Ago and marvel at the way these speakers deliver voices in such a solid and expressive way. You’d need to spend closer to four figures to get any better in this respect. There are rivals that dig up as much information, but few deliver it with such a sense of passion and enthusiasm. Tonally, these are nicely judged with a smooth treble that still has plenty of bite and a full-bodied presentation that sounds impressively confident and composed. That controlled attitude remains unchanged, even at higher volume levels where most rivals would start to harden up. We’re impressed by the way these speakers convey the wide-ranging dynamics of Stravinsky’s The Rite Of Spring. They manage to render an expansive and sharply focused soundstage that stays stable regardless of the recording’s complexity. Larger rivals will have more scale and sonic authority, but they won’t be anywhere near as accommodating as these Dalis when it comes to placement or blending into a room. It’s the Oberons’ ability to reveal so much information, but also arrange it in a musically cohesive way that really makes them shine. On the surface these may look like a posh pair of Spektor 2s, and there are certainly some strong visual similarities. But start listening to the Oberon 1s at the end of a suitably talented system and you’ll find they’re capable of sonic feats the junior speakers only hint at. But aside from the limitations of size, they produce a quality of sound only the very best at this level can get close to. If you’re looking for a small, unfussy pair of speakers we can’t think of anything more capable at this kind of price than these Dalis. They really are a joy.